Public Engagement Fellow Sarah Milkowski-Dahlgren ’17 has been selected to receive the Maine Campus Compact Student Heart and Soul Award at their 15th annual awards ceremony, hosted at the Hall of Flags at the Maine State House in Augusta. Maine Campus Compact recognizes six undergraduate students who have been actively involved in turning their campuses and communities into places of democracy. These students have raised their voices on issues of local and global importance through civic engagement efforts. Awards are given based on a student’s status as a leader to their college classmates and for their outstanding commitment to promote the values of democracy through activism, service, and community involvement. Sarah’s passion, as well as her artistic work and aspirations, are deeply invested in creating positive change, building community, and creating a healthier planet. She leads the MECA student group Trash Talkers, an environmental group that takes action institutionally as well as within the community of Portland. Since the focus on climate is also a global issue, the group participates in global actions such as 350’s Global Climate March, organized around the Paris Climate Summit. 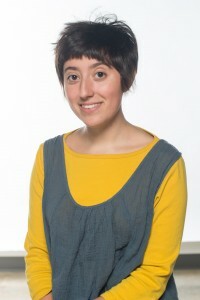 Sarah’s work also focuses on institutional goals such as composting in the MECA Cafe, recycling, and conserving energy. Under Sarah’s leadership as student sustainability coordinator, composting has been expanded to the entire Café and two residence halls, and she helped MECA create a multi-year environmental action plan. Sarah also created and implemented a sustainability survey for the MECA community to identify ways that individuals or departments can further reduce energy usage, increase recycling and composting on campus, and reduce or eliminate the use of chemicals that are harmful for the environment. In the fall of 2015, Sarah partnered with local community members of Maine 360 and students to lead a Climate Change Rally in Portland, Maine. The “Turn the Tide” rally called for leaders to agree on cutting carbon emissions and to transition to 100 percent clean energy by the year 2050. Sarah created a large puppet for these events whose presence created dialogue and excitement about saving the ocean and the animal and plant life it supports.